It was with some reluctance that I began watching Enterprise a year ago. I had heard some good things about the show that attempted to carry on the great tradition of Star Trek, but some troubling anecdotes about strange plots, thinly-veiled social criticisms, and a feeling of incoherence overall. But I figured it was worth a shot, and after finishing the series, I can say for sure that I am glad to have seen it all. But the show, while ranging from not-too-shabby to downright lame, never hit the high water mark of syndicated science fiction set by its forbears, and in the end I was actually a little relieved that it was over. Like a guest who has overstayed his welcome, it was time for the show to end. But unlike such a guest, the show wasn’t about to go without a fight. And fight it certainly did. Between season 2 and 3, the writers threw caution to the wind and set about exploring an entirely new storyline that had its sights set on standing shoulder to shoulder with the best of Star Trek Epics. Sadly, the Xindi conflict of Season 3 wore on ad infinitum, which was reflected in dismal TV ratings, and by the end I would say it’s a safe bet that everyone involved in the production of the show knew they had cashed in pretty much all their chips. In short, the writing was on the wall: Archer and his crew would get one more season before their warp drive would power down for good. Whether that scenario is what went on prior to the creation of Season 4 or not, it’s safe to say that the show certainly went out with a bang–probably because there was nothing left to lose. Season 4 was the best of the lot, and had some wonderfully high-concept episodes as well as several that at least attempted to delve into the real meat of Star Trek: an exploration of the human condition. Dr. Arik Soong, the central character in one of Enterprise's most interesting and well-executed storylines. Shackled with none of the overarching “Stop the evil Xindi, I guess” modus operandi of Season 3, the crew of the Enterprise find themselves embroiled in conflicts large and small, laying some very interesting “prequel” groundwork for several episodes of the original Star Trek, and even giving a definitive answer to that age-old question of why Klingons don’t have wrinkles on their foreheads during the time of Captain Kirk. 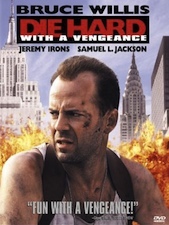 Season 3 ended with a strange cliffhanger involving alien Nazis in an alternate-reality World War II on earth, the conclusion of which not only involved just a bit too much deus ex machina for my taste, but also put an end to the temporal cold war once and for all. I actually thought the concept of interstellar conflicts that twisted the fabric of time was one of Enterprise’s more compelling subplots, but wrapping it up so early in the season meant it was no longer a crutch on which the writers could lean, and thus resulted in some far more interesting plots instead. In fact, some of the best episodes of the short-lived series were in Season 4. “Borderland,” “Station 12,” and “The Augments” focused on some very compelling issues regarding human genetic modification, and had a good mix of action, characterization, and moral philosophizing. They also explored some of the history of Commander Data’s “father,” Dr. Noonian Singh, which I found to be not only interesting but very creative as well. “Affliction” and “Divergence” brought back the Klingons, who had been in the first few episodes of the series but conspicuously absent for much of the subsequent episodes. In fact, while these two episodes were both exciting and tense, they also showed a bit of tongue-in-cheek humor as they cleverly explained the lack of forehead ridges on Klingons during the time of Captain Kirk. 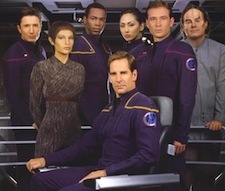 Throughout the season there was an increased emphasis on characters and relationships within the context of intergalactic conflicts, rather than the other way around, and while this not only lent an added emotional weight to the season overall, it also helped draw in viewers on an emotional level and connect with the Enterprise crew. The relationship between T’Pol and Tucker took some interesting turns, though the T’Pol’s wedding to Koss in the early episode “Home” was a cheap attempt to add in some contrived relationship conflict, and I was glad to see this subplot wrapped up midway through the season. We also get a bit of backstory on some others like Mayweather and Reed, but Hoshi, whose fairly useless character should have been written out years ago, remained sadly on the periphery for the entire season once again. Despite their lofty ambitions, the "Mirror Universe" episodes didn't quite live up to their potential. Much has been said about the lauded two-part “Mirror” episodes by other Trek commentators, but I found them to be distracting and rather pointless, mostly due to an entire lack of resolution. While I understand that these two were never supposed to connect with the regular universe, and existed simply to give us a glimpse into the mirror universe for a little while, the rise of Empress Hoshi at the end of part 2 was a cheap way to end them. It’s as if the writers had no intention of providing any sort of resolution for the myriad conflicts they had developed, and rather than even attempt any sort of resolution or denouement, just threw up their hands and called it quits so they could get on with the ship’s adventures in the regular universe. Not cool, Mr. Sussman. The final episode of the series did a fairly decent job of bringing things to a close, but it was more of a love letter to The Next Generation than a good conclusion to Enterprise. But for a series that had consistently met average expectations for four years, I suppose it was about all I could have asked for. In the end I would have liked to see the series and characters in the hands of a more capable writing crew, but at least it went out on a fairly good note overall. Season 4 was the best of the bunch, even though the show still felt like the kid brother to its TOS, TNG, and DS9 brethren. But even so, it was a decent run while it lasted. It’s been a long haul for the Star Trek series. The crew returns for another season of outer space escapades. The first incarnation of Star Trek, though its opening credits had a voiceover with William Shatner extolling the “five-year mission” of the ship, only lasted three seasons. The first Star Trek movie barely made it off the ground, so to speak, but was popular enough to spawn a multitude of sequels (some of questionable quality). Star Trek: The Next Generation revitalized the ailing franchise, though, and became the most popular syndicated television show of its time. Its spinoffs, devoid of the imagination and human insight of Trek creator Gene Roddenberry, foundered in concepts as well as ratings. Deep Space Nine and Voyager were interesting, the former being much better in its twilight years than many people give it credit for, but too often relied on tired clichés and political wranglings set in motion by Jean-Luc Picard and company. 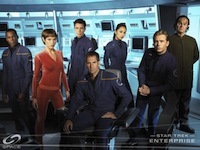 Enterprise aimed to reboot the series in the minds of fans as well as the general public, and spent its first two seasons adrift in a sea of high-minded but poorly-executed storylines that tried to capture the outrageously science fiction, yet uniquely human, essence of the original show. Mediocre conflicts with Souliban, Vulcan, Klingon, and numerous other alien species, a smattering of half-baked character backstories, and a few ship-in-peril episodes thrown in for good measure, weren’t enough to raise the show to more than a mere curiosity for most Trek fans, and a last-resort DVR viewing for everyone else. 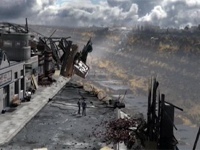 With season 3 of Enterprise, the creators must have smelled a bit of lemon on their hands, as they threw everything from the first two seasons to the wind and launched the ship, and the series, in a whole new direction (literally and figuratively) while setting up an Earth-in-peril plotline of epic proportions that spanned the entire season. And while I applaud the minds behind the show for trying something new and different (effectively going for a fouth-down conversion on Enterprise’s own 10-yard line), the end result is another just-beyond-mediocre chapter of a show that once carried so much promise. 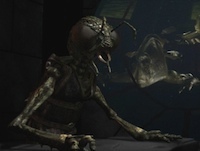 Xindi come in five flavors, two of which are named "Insectoid" and "Aquatic." Can you guess which is which? The season begins with earth being attacked by an entirely heretofore unknown race called the Xindi. A small probe burns a wide channel in Earth’s crust from Florida down to Argentina, killing 7 million people in the process. Enterprise, having arrived back on Earth at the end of Season 2, is sent into the also heretofore unknown region of space called the Delphic Expanse–a stellar Bermuda Triangle of sorts from which no Vulcan ship has ever come back intact–to investigate the probe’s origins and stop any further destruction. We soon find out that the probe was sent by the Xindi because they believe earth is going to be responsible for destroying their planet at some point in the future. As such, all five species of Xindi band together to plan a pre-emptive strike against the humans, and ultimately ensure their own survival by constructing a giant circular weapon to blow up our planet. The probe, you see, was merely a foretaste of the Xindi feast to come. It’s clear that Rick Berman and Brannon Braga, the minds behind this as well as much of the other Trek spinoffs, had lofty goals in mind here. And I appreciate the epic nature of what they are trying to do: send Enterprise on a thousand-to-one-odds mission, into an uncharted region of space, to stop the planet from being annihilated. But that sort of paper-thin cocktail napkin premise requires a massive amount of story in order to span an entire season, and too often the result is a plot that is mired in strange twists and deus-ex-machina resolutions that stretch the limits of credibility. Even the basic idea seems like something out of an Austin Powers movie: an megalomaniac wants to blow up the planet, and it’s up to one man ship to stop it. Pardon me while I yawn. Death Star? Borg ship from First Contact? No, this is WAY different. It's a "Xindi Superweapon." Guess what it does? It destroys planets! Still, the season does have its high points, and I must give credit where credit is due. “Twilight” hearkens to one of the best episodes of any TV show ever, “The Inner Light,” and does a good job of showcasing the type of alternate-reality future that often goes over well in Trek mythology. I appreciate the character development given to T’pol, as she struggles with a loss of emotional control through an addiction to a psychoactive chemical, but her romantic relationship with Trip is about as forced and unbelievable as they come. “Similitude” and “Hatchery” delve into some moral choices that are the hallmark of good science fiction, and E2 reminds me of one of the best TNG episodes, “Yesterday’s Enterprise” in both concept and execution. What’s missing throughout this season, though, is the same thing that’s been missing since the inception of Enterprise: characterization. After more than 70 episodes of the show, I still don’t have much of an idea of who these spacefaring crew members really are. Hoshi continues to brandish her superpower of language translation whenever it’s required. Mayweather dutifully embodies the straight-faced version of his Galaxy Quest counterpart Tommy Webber, but nobody told Mayweather that his counterpart was meant to be a caricature. The list continues, and few characters are ever lifted beyond the base level of cardboard cutout. One 20-minute episode of Arrested Development has more personality than the entire Season 3 of Enterprise, largely because these individuals exist as jobs that need individuals (“Weapons Officer,” “Engineer“) as opposed to individuals (“Smart but socially akward guy“, “Charismatic womanizer,” “Brilliant, overworked widow“) who hold given positions on the ship. 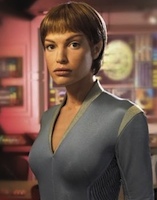 T'Pol also gets some decent character development, but it feels a bit too contrived. Some attempts to flesh out these people are made, the most notable being Trip as he deals with his sister’s death at the hand of the Xindi when the probe attacked earth, and later, in an inexplicable breach of established characterization, falls in love with T’pol, as if to fulfil a “Show needs more romance” checkbox on a focus group feedback form. But most of the series is riddled with one-off attempts at characterization that exist in isolated episodes rather than being woven into the fabric of the show as a whole. 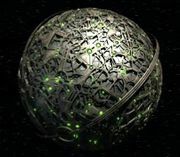 The ideas that show up throught Season 3 are impressive: giant spheres constructed milennia ago that cause gravometric distortions throughout the Delphic Expanse, the various political wranglings of the five distinct Xindi species, and the moral choices that must be made by Captain Archer get into some pretty heavy territory. But too often the show sacrifices the essence of Science Fiction on the altar of fanciful CGI effects. Here’s hoping the best for Season 4. One thing I appreciate about Enterprise is its level of ambition: some episodes really reach for the stars (no pun intended), and while most of them don’t end up being all they strive to be, I give them credit for at least trying. The Star Trek universe is a rich canvas on which an incredible variety of stories may be painted, and I like it when Berman and Braga just go for it and throw caution to the wind. The Expanse is one of those episodes. I can’t say that it’s entirely successful at what it sets out to do, but it’s certainly an interesting and entertaining ride along the way. The show starts out with an attack on earth by an alien probe, reminiscent of Star Trek IV, The Voyage Home. Except instead of churning the oceans, this probe cuts a swath right out of the planet roughly 300 yards across and 4,000 miles long. It starts in Florida and goes clear to Venezuela, after which the probe self-destructs and bits of it crash-land on Earth. Blackout. 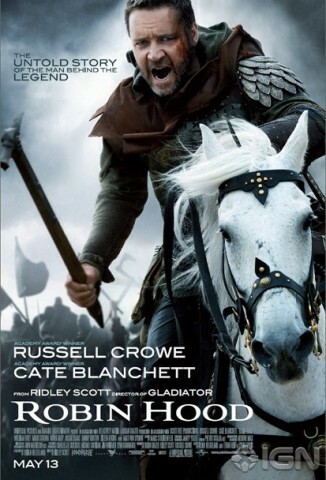 Cue opening credits (and, of course, the mute button. *shudder* that opening ballad is still terrible.) This, my friends, is how to open a season finale. This was a mixed bag if ever one existed. One one hand there is a strikingly well-written and well-executed plot regarding Archer’s abduction at the hands of a bounty hunter. It is suspenseful, engaging, and ties into some threads established clear back at the beginning of the series. Archer pulls some Picard-style psychological tricks on his captor, busts out with some old-fashioned Kirk-style fisticuffs on some Klingons, and even helps a rather shady character redeem himself. In short, it was the kind of plot that made Star Trek: TNG so likable in the 1990s. The rest of the Doctor/T’Pol subplot is a hamfisted attempt at what I can only assume is Berman and Braga’s idea of comedy, as Jolene Blalock makes an idiot out of herself and the Doctor (and all other crew members) try to knock some sense (and a cure) into her. One thing I have grown to appreciate about Enterprise (in and of itself an origin story of sorts) is the way it also explores the origins and backgrounds of its characters. This episode, despite being ranked rather obviously in the pantheon of “save the budget” episodes, did a good job of exploring more of Archer’s background and gave us some additional insight into his longstanding friendship with Trip. It was a nice counterpoint to Regeneration’s relentless and frentic action, and I rather enjoyed it–probably in no small part due to the superb direction of series veteral LeVar Burton. Things got started, as they so often do, with a mission that led to much more than the crew was ready to handle. Turns out the ship might be headed into a nebula full of dark matter, but they aren’t exactly sure just what is out there. Everyone is pretty stoked at the possibility of exploring this in a shuttlepod when Archer gets some bad news that someone named “A.G.” has died. Turns out that A.G. is a longtime friend of both Archer and Trip, and the news of his death immediatly sends the Cap’n into one of his emo moods, which left me holding my breath for another embarrassingly bad show (Hugo Award nominations be darned!). Here’s the long and short of it: this episode was really, really good. It’s the kind of episode this show has needed for a while, following a string of technically impressive but overall unremarkable stories. And while the fudging of canonical issues like phaser output and Borg nanotechnology was present, all is forgiven in the face of such a cool episode. Things begin back on earth where a team of scientists unearths the remnants of a Borg vessel–the same spheroid, we soon discover, that came back in time during First Contact to prevent Zephram Cochran from making his initial warp-drive test. Soon the crew of the Enterprise is battling it out with some nasty Borg deep in space, and it’s not long before crewmen are assimilated, shields are adapting, and ensigns expendable get killed off in the most classic of Trek fashions. This episode was thrilling and engaging, and I was honest-to-goodness cheering out loud when Archer jettisoned two Borg out into deep space–the kind of thing I was hoping a starship captain would have done years ago in the face of such ruthless enemies. In fact, I have to say that the Jonathan Archer as of late who is more aggressive, decisive, and, well, commanding, is a welcome change from the wishy-washy Captain who once spent the night in sickbay with his puppy. However, despite the sheer entertainment factor of this episode, it’s important to note that a somewhat disconcerting trend is beginning to take shape. This was an episode that had high ambitions, but fell short more than a few times of actually attaining them. One of the two plots involves a team of three cavers (Tripp and Malcolm, led by Travis, who is apparently really darn good at spelunking. He must have learned it during all those years aboard a cargo ship…or something) who are sent to rescue a team of Denobulans who have been basically living underground on a foreign planet in order to collect rocks. Turns out the planet is being taken over by some really nasty people who don’t want these three aliens exploring their caves, so who better to go get them than the crew of the Enterprise? Yeah, I was wondering that myself. Meanwhile, back on the ship, Doc is having a culture crisis as one of his patients, who is from a freighter orbiting the planet, is an Antaran, and just as three horns don’t play with longnecks, everyone knows that Denobulans don’t like Antarans, and vice versa. He kind of wants to treat the patient, but the patient would rather die than be treated by a Denobulan. Do I sense a lesson in understanding coming? Yah, you betcha. Recently I was discussing Enterprise with one of my friends. I told her that the show felt too stilted, and often uninteresting, as if the creators had some sort of list for qualities a show should have and would check them off one by one as they completed an episode. This episode more or less typifies my thoughts about the show in general, partially because its focus on Travis Mayweather’s home life/background story seems a bit too forced and contrived, and also because the subplot about T’pol and horror movies back on the Enterprise felt a little too tacked on. It seems as though Berman and Braga were sitting in a room one day and thought to themselves, “Hey, we don’t know much about our navigation fella. Let’s do a show on his family, or something.” And thus was the genesis of “Horizon.” Mayweather gets notified that his father, captain of the cargo transport vessel Horizon, is on his way to that big shipyard in the sky, and fortunately the Enterprise is heading in a direction that just so happens to take them near the ship. As soon as they arrive we find out that Travis’ dad has already passed away, his brother is now captain of the ship, and his mom, who acts just like the Oracle from the Matrix, keeps the ship running while passing out nuggets of wisdom and advice like a human PEZ dispenser. Meanwhile, Tucker invites T’pol to watch the original black-and-white Frankenstein because he wants her to experience a horror movie. She resists at first, but once again we have the non-human character make all kinds of observations about human behavior while growing more human herself. Again, this subplot just doesn’t feel natural. It’s kind of interesting, but at the end of the day it seems like it arose out of the need for a subplot, not the desire to truly explore human emotions. Travis, as anyone could have predicted, is having trouble dealing with his father’s death. His brother doesn’t like his Starfleet sibling to come back and act like he knows what it’s like to be on a cargo ship again. Their mom plays the middle, they all get in a bad scrape, and by the end of the show we’ve all learned a valuable lesson about overcoming differences, putting aside old conflicts, and working together as a team. Awww. It’s not that the episode was bad, it just wasn’t as good as it could have been. And that all stems from a lack of true characterization–most of the cast seems like they are merely inhabiting a role rather than playing true characters who live and work together on a starship. But we’ll keep plugging away and see how the rest of Season 2 plays out.